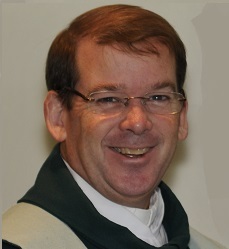 Roger Bower is the current Pastor of St. Andrew’s Episcopal Church located in Valparaiso, Indiana. After growing up in and around central Texas, Roger has been involved in ministries in Texas, Montana, New York, California, Colorado,and now in northwest Indiana. He has an undergraduate degree from the University of St. Thomas in Houston as well as a Masters Degree in Theology from St. Mary’s Seminary, also in Houston. Roger is passionate about helping people live out the gospel of Jesus Christ in the real life situations of relationships, family, friends, school, and community. His most profound joy is spending time with his wife Barbara and their two teenagers, Kathryn and Christopher. His hobbies include snow skiing, traveling, and learning about leadership.